Would you stay in a 15-story structure built in six days? 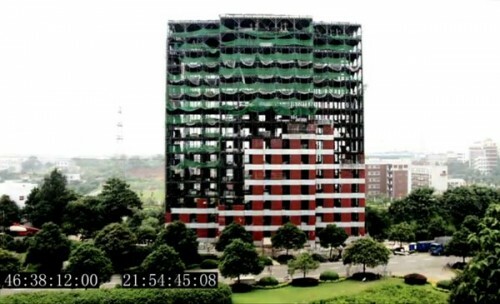 Through the magic of prefabrication, one new hotel in Changsha, China was built erector-set-style at just such a fantastic pace and recorded through time-lapse photography. The better term might be constructed in six days, however, as the building’s foundation and the factory-made pieces were already finished at the beginning of this architectural ballet, but the feat proves rather amazing nonetheless. While you might have never heard of Changsha, China, home to the new Ark Hotel, the country’s 19th largest city mirrors the building’s rapid growth. Changsha tripled in size between the 1940s and 1980s and today contains an estimated population of 6.6 million. While such a quickly constructed building might seem prone to shoddy construction, the Ark Hotel is reportedly built to withstand a magnitude 9 earthquake, meaning a quake over 1,000 times more powerful than January’s quake in Haiti. Call us skeptical, but we’d opt to be out of the building when disaster strikes.